It’s that time of the year again. I try to write out a reflection post, looking forward to the New Year every January. But to be honest, I don’t want to reflect on 2017. I have never been so happy to turn the page on a new year than I was on December 31st, 2017. A lot happened this year. A lot that I really don’t want to remember or reflect on. I only want to look forward. But, while this year had its struggles, it wasn’t all the overwhelming black cloud I make it out to be. When I look back on this past year, I tend to only look at the big, bad things that happened. We had some major things happen to us in 2017 that I wouldn’t wish on my worst enemy. I should have ended this year with a 3 month old baby. But in May, we lost the pregnancy. And from there, things just spiraled downward, the year circling the drain before the halfway point. I don’t really want to get into the particulars, but long story short, I got into the mindset that that event defined my entire year. I jokingly said to my husband the other day “oh 2017 killed the old, fun-loving Bri”. I really was trying to make light of something, but it wasn’t until I said those words out loud that I realized I had let that dark cloud define 2017. So I sat down and tried to write down the positive things that had happened this year. And there were more than I had really given thought to. This year wasn’t all dark and stormy. There were some silver linings through those storms. I traveled a LOT this year! I got to go to Portland, Los Angeles, Sacramento, Pittsburgh, Wyoming, Nevada, Wisconsin and Chicago this year (I may even be missing a few places in there). I have a really good job that allows me to go to these places for work and provides an avenue to explore parts of the country I wouldn’t have gone otherwise. I started my YouTube channel! Bullet journaling became a huge part of my life following the loss of my pregnancy. It was a way to be creative in my own way, while feeling like I was getting a handle on my life and getting everything organized. A couple months later, after people had asked me about it, I filmed a video and put it up on YouTube. That started everything else! From there, I began to film more and more videos about bullet journaling, and then ventured into the world of vlogging. It’s definitely been an adventure! I monetized my blog! This was one of my goals for this year. Now, before you get too excited. It wasn’t much. But it was something. It just goes to show that all this hard work is actually beginning to pay off. I participated in and won NaNoWriMo! I didn’t talk about this on here, but I did do a lot of vlogs about it throughout the month of November. Basically, NaNoWriMo is a global challenge where people attempt to write a 50,000 word novel in the month of November! Check out my videos for more information on it and how I managed to win it! I inspired other people to Bullet Journal! This is a big thing. Originally I didn’t set out to encourage others to start bullet journaling, but once I started the channel, that became my main goal. I didn’t care about the views, or the subscribers. I just wanted to reach people and inspire others to begin the journey. And I did just that. I have friends both in real life and on the internet that have purchased their first bullet journal and started the process, either beginning in 2018, or before. So. That was 2017. While there were some serious low points, it wasn’t all bad. 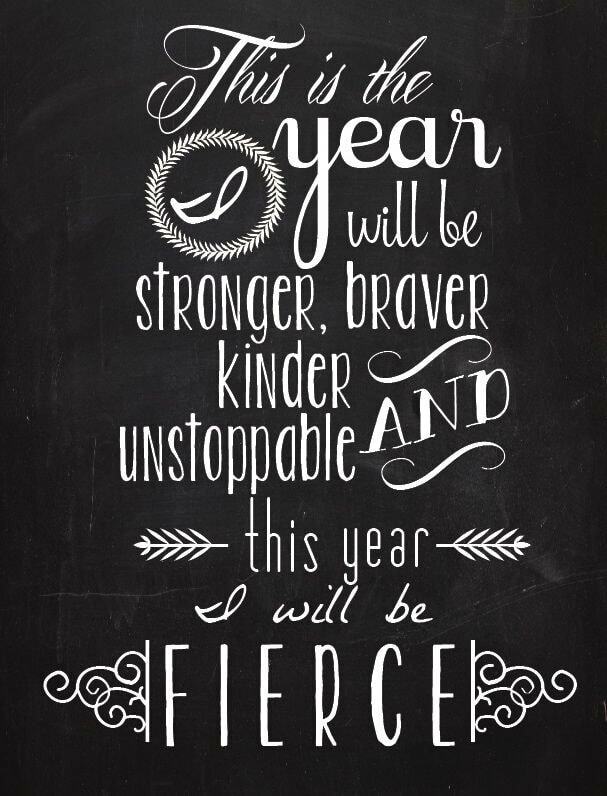 Nevertheless, I am excited for this new year to begin. I have some goals for this year that I would like to share with you, both for accountability and hopefully to let others know that you’re not in this alone. We all have crap we’re going through. We’ll make it though. My first goal is more of a mindset that I would like to go through this year in, while the other goals are more concrete. See the things around me in a positive light. ~ I don’t want to get sucked into the darkness that enveloped me last year. I want to maintain a positive outlook on my world around me. The world is negative. Just turn on the news and you’ll see that. It’s a dark, depressing place. But if I make a point to look at things in a positive light, always looking for the silver lining, I can improve my mental health and exude joy and peace to those around me. Create content consistently. ~ As you’ve probably noticed, I’ve been pretty silent on this blog for the last few months. I spent the majority of my creative time trying to build up my channel, but now that I feel like I have a good starting point, I would like to continue to create content here. So, here is my plan (and I will likely have a more concrete schedule coming in the coming weeks). 1-2 blog posts a week, and 2 videos a week, one of them being bullet journal related and one being more random. It could be an unboxing, a vlog, something related to booktube, or just something random I want to talk about. Make healthy choices ~ Now, my overall goal is to lose weight, but in the past that hasn’t worked. That’s because I was in the mindset that I hated the way that I looked now, and wanted to change it. I’ve come to find out that change doesn’t come from self loathing. I want to change that mindset that I’m making healthy choices because I love myself, not because I hate my body. I want to eat nutriously, and go to the gym 3 times a week, with the goal of increasing that over the coming months. I also want to start getting into Yoga and meditation more. I really enjoy doing it, and I want to be more consistent with it. Organize my home ~ I love coming home to a clean space. Unfortunately, that doesn’t happen that often. In December, I spent more days outside of Utah than I did in it. So needless to say, my house is in complete disarray right now. But this week, while I’ve been on vacation, I have spent a lot of time deep cleaning, organizing and purging. I’m trying to make it so everything has a place. My goal is to keep it that way. I want to create a consistent cleaning schedule of what to clean and when, but also get into the habit of not leaving messes before I go to bed at night. If all the dishes are put away and everything is picked up before I go to bed, it’s more likely that my house will stay cleaner in the long run. Read at least one book from each of the major genres (Fantasy, Sci-Fi, Classics, Mystery/Suspense, YA, Romance, Non-Fiction, Women’s Lt/Chick Lit) I know there are a lot more genres out there, but this is a good start. This is really the first year in a long time that I’ve been excited to read again, so baby steps. So that is pretty much it. I’m still working on my yearly goals from my Birthday of things I want to do this year, and I will post something about it next month at the half way point. A lot of these are extensions of those goals, or ways that I can achieve them. So I’m not adding much, more just enhancing it. Did you create New Year’s goals or resolutions this year? Share them in the comments below! Next 2018 TBR: PopSugar Reading Challenge Edition! My goal is to be more active and consistent on my blog as well! Congratulations on starting your YouTube channel, this is awesome!